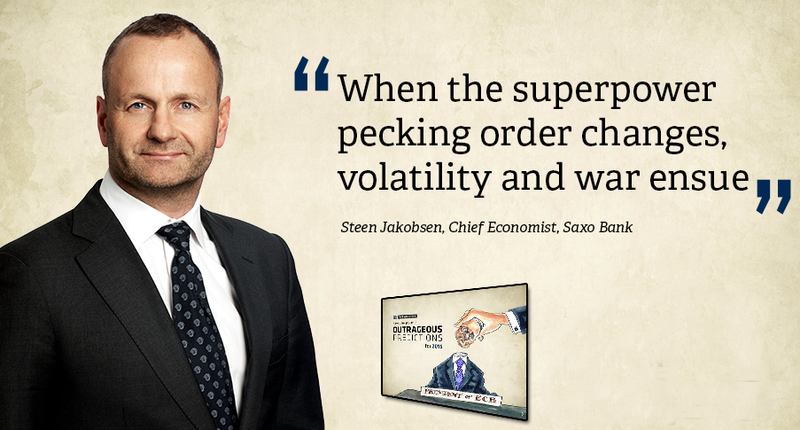 Saxo Bank, the online multi-asset trading and investment specialist, has released its annual set of ‘Outrageous Predictions’ for the year ahead. These are 10 unlikely events, even if their risk is under-appreciated, that would have significant consequences for global markets should they come to pass. This year’s predictions include the notion of a UK exit from the EU after a landslide gain by the UK Independence Party in the country’s general election. Other outrageous predictions include Mario Draghi quitting the European Central Bank to become Italian president, a UK housing market crash, and the eruption of Icelandic volcano Bardarbunga, which could cancel Europe’s summer in 2015. Surveys are already showing that momentum is fast leaving the UK housing market, particularly in London. The impending Bank of England rate hike will see the UK suffer a housing crash with prices falling as much as 25% in 2015. Incessant Bank of Japan money printing crushes confidence in the yen as Kuroda-san finds that his policy to bring inflation back to his country is met with too much “success” – a symptom of Japan losing control of its currency. China will be looking for any way it can to ease the enormous deflationary pressures that are the downside of a credit boom. As deflationary risks loom China tears a page from the BoJ policy playbook and moves to devalue the yuan by 20%, joining Japan in its fight to import inflation and demand. To bring the Germans fully on board with the European Central Bank’s move to QE, Draghi steps aside to allow for full ECB quantitative easing to proceed under a new president, Jens Weidmann of the Bundesbank. Draghi sees greater opportunity for his skills in Italy, where President Napolitano requests that he succeed him. ”There is a perfect storm brewing for the Russian economy that could end … with the government itself selectively moving into a default”. Plunging oil prices and a cold financial shoulder from Russia’s geopolitical antagonists see large Russian companies or the government itself defaulting on foreign debt. A default, like in 1998, is what is needed to secure the country’s future, together with a diplomatic solution on the Ukraine question.